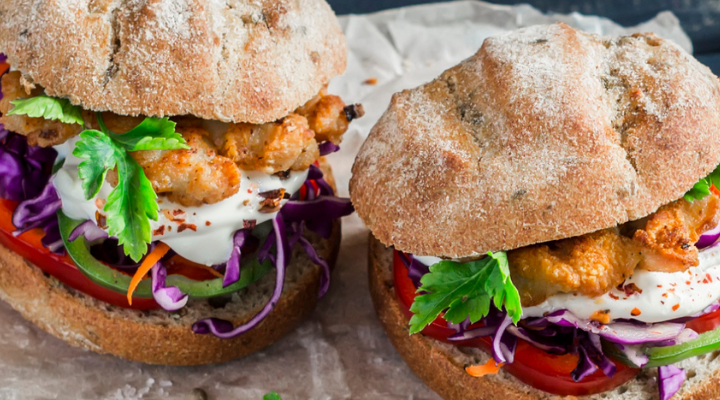 These mildly flavoured burgers are a good way of getting fussy eaters to enjoy fresh fish. Check the fish for any bones, then cut into medium-sized pieces. Put the fish into a food processor or blender along with the spring onions and process briefly, until the ingredients are finely chopped. Add the breadcrumbs, egg white and a little salt and pepper and blend again until all the ingredients are combined. Divide the mixture into 4 portions and shape into flat burgers (run your hands under the cold tap before shaping so the mixture won't stick). Warm the oil in a pan set over a medium heat. Add the burgers and fry for about 3 minutes on each side, until golden brown and firm. Meanwhile, mix together the yogurt, mayonnaise and a little salt and pepper. Split the buns in half and pile some salad leaves onto the base of each one. Put the burgers on top and add a spoonful of the yogurt mayonnaise. Sandwich together with the burger tops and serve straight away. Tip: These fish burgers can be grilled too. Just brush both sides with oil and cook on a foil-lined grill rack under a moderate heat for about 5 minutes on each side.